I've always wondered how a sculpture that resembles a kite can be called David and Goliath. Well, maybe if we frame a tiny human shape next to the tripod then everything makes sense. 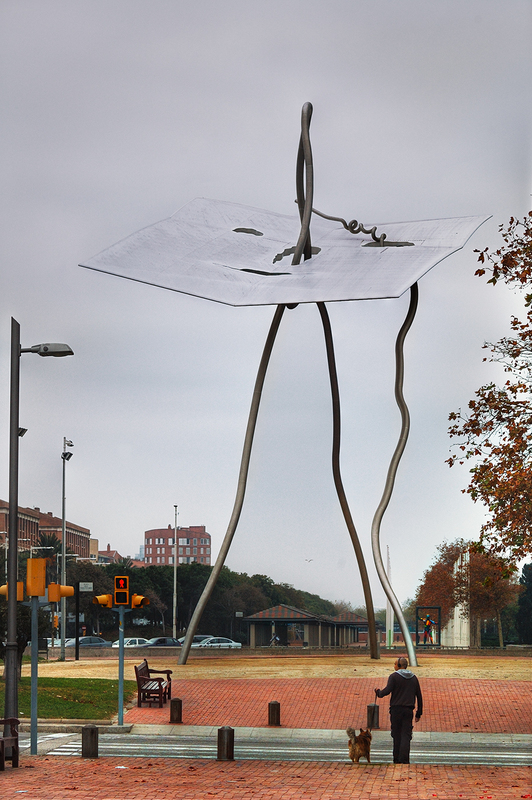 This sort of War of the Worlds machine marching ominously along Plaça dels Voluntaris (yes, not as catching a word as the original "Surrey") was made by Antoni Llena for the Olympic Games in 1992. The day was foggy and not picture friendly but that doesn't mean we have to stay at home. I hope you like it come what may. Wow, one thing is sure, it's a big sculpture! And weird, and I like it. I think the lone twisty pole is supposed to symbolize the bullet David shot into Goliath's eye. I have seen it myself although I couldn't easily explain the meaning and the message of it... Have a great day Carlos! I assume Goliath is the face and David's the metal pieces coming out of the eye and nose? It's strange, but I actually like it. Looks like a rectangular relative of our avatar floated across the sky and happened to land on a wire hanger stuck in the ground. That's for sure an impressive sight, making one feel indeed like David, just by looking at it from far. Must be quiet moving to walk beneath in reality. wow that's quite a sculpture - very huge!